The Highlander blossom is a Pink White Rose that is renowned for its duo colored beauty. Highlander blossoms have a creamy colored base and it is edged with a dark pink rim. There bushels can add a pinch of color to any bouquet or centerpiece that has a white theme that does not want to stray off too much. They symbolize appreciation, purity, beauty, and love, making them a perfect match for proms, birthday parties, and weddings. Well suited for centerpieces, They makes magnificent boutiques due to their lovely color which is not too express but gets the message of love and unity across. Since theys are exquisite yet humble, it can be used for events ranging from birthday parties, office gathering, and weddings. At Globalrose.com we love our products and we respect Mother Nature, which is why we practice safe and clean procedures in order to protect our environment. We use these methods all year round so that Mother Nature and you can be at ease that here bounty and your next event are in accordance with nature. Gobalrose.com is open for business all year round so that you can buy whichever florets you need for the next big event you plan to hold. We deliver all of our products through FedEx because they are known for fast and promptly deliveries. 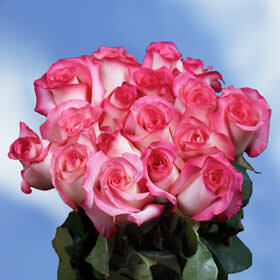 Your Highlander Pink White Rose order will arrive to you closed and will need a maximum of three days to full bloom.